San James is Pursuing a PhD in Medicine, Majoring in Virology at the Nelson R. Mandela School of Medicine, University of KwaZulu-Natal, South Africa and is a Bioinformatics Research Associate at the Kwazulu Natal Research and Innovation Sequencing Platform. 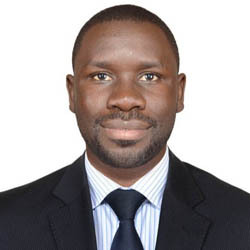 Owing to his experience working as a Systems Analyst and Programmer with the Infectious Diseases Research Collaboration where he participated in exciting projects such the development of a clinical data visualization platform and Data Management Specialist at Global Health Uganda, he developed a keen interest bioinformatics research especially in the areas of Bioinformatics Software and Pipelines Development, Next Generation Sequence Data Management and Analysis (Phylogenetics, Recombinants and Drug Resistance), and High Performance Computing for Data Intensive Projects. His PhD research focus is in Microbial Classification and Detection, Development of SOPs for Sequence Analysis Projects, Validation of Existing Pipelines and setting up a standardized and structured bioinformatics environment. KRISP - KwaZulu-Natal Research and Innovation Sequencing Platform, UKZN, Durban, South Africa. Department of Virology, National Health Laboratory Service (NHLS), Durban, South Africa (PhD Fellow). Master of Science in Data Communications and Software Engineering, Makerere University, 2016. Funded by the Forgarty International Center Scholarship.